You're walking down the beach for some much needed 'you' time. The sun is setting and you're really enjoying the serenity of the sounds and smells of the beach. We're really excited about our new call for art! Are you interested in joining us as one of the artists for our next exhibition? Submit your name, email and portfolio link in the comments below by Thursday November 22. 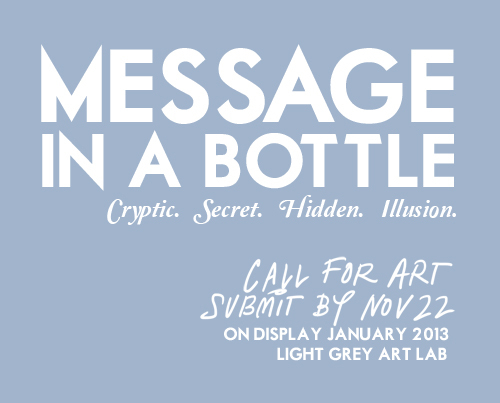 Message in a Bottle is an exhibition focusing on little secrets, special things, hidden treasures and mysterious messages. From mid January through mid February Light Grey Art Lab transforms into one giant decoder ring / spyglass / Rosetta stone / Pandora's box / Mad Magazine fold-in. What does that mean? It means we want everyone to look a little harder at the details. Is there something secret in the art? We hope so. With the Message in a Bottle Exhibition on the walls as the perfect backdrop, we will be dedicating workshops, lectures and events around the topic of Secrets, Codes, Mysteries and things of that nature! We are looking for approximately 40 or so artists that are interesting in making viewers covet the details, look for hidden compartments, find secret messages, decipher codes and really spend time looking through the work for inconspicuous elements. Do you have the ability to create something cryptic? If so, we want to hear from you! If you think you'd be a good fit for our upcoming show, put your name, email and a link to your portfolio below by Thursday NOVEMBER 22. The work for this show will be featured as prints in our gallery and the work will be showcased online for everyone to view and take part in the fun! We're hoping to have a range sizes, styles and interpretations. More details about size limitations, deadlines and other important information will be emailed out to the selected artists the week of the 26th, and we'll be sure to post the names of the contributors here! Also - For those of you that like to plan a little bit out - the deadline for final artwork will be January 3rd, so please keep that in mind when submitting! More details on the final exhibition dates will be posted soon! Until then, show us what you've got! Know someone that might be perfect for our show? Please help us spread the word!